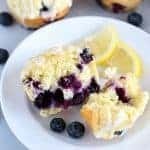 Lemon Blueberry Muffins – Fluffy and tender lemon muffins filled with blueberries and topped with a tangy lemon icing. “Company Muffins”: These are the muffins you make when you want everyone to be impressed. You make them for company, you bring them to a brunch, and you serve them on holidays. They’re buttery, sweet and tender – like something from a bakery. “Everyday Muffins“: These are the muffins that I make for my family on a regular basis. Because we can’t always start our day with something that closely resembles cake (gosh darnit! 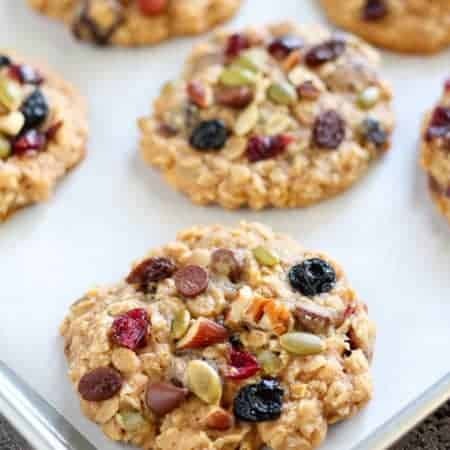 ), I make some healthy swaps like reducing sugar and swapping in whole grain flours etc. These Lemon Blueberry Muffins fall squarely into the “Company Muffin” category, and I couldn’t be happier about it. 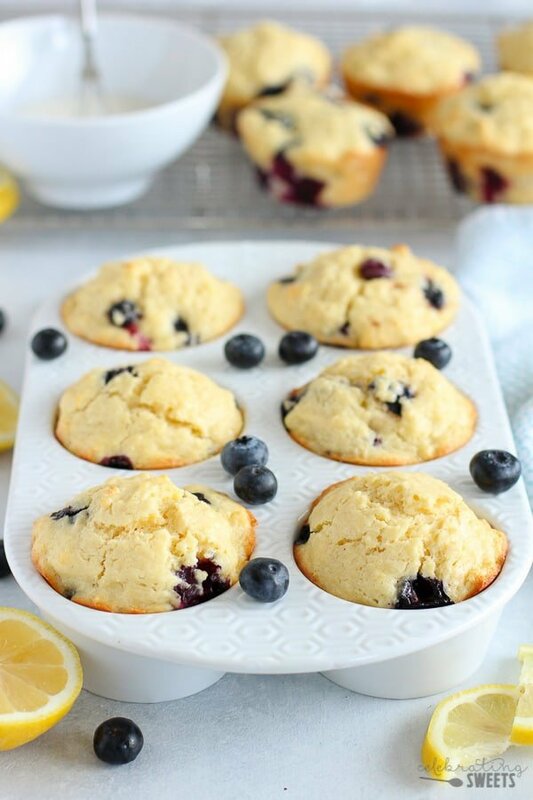 You need to make these, and share them, and spread the Lemon Blueberry Muffin love! Lemon zest, lemon juice and lemon glaze ensure that every bite of these muffins is loaded with bright lemony flavor. Sour cream makes these muffins extra moist, and gives them a tender texture. The tang from the sour cream also compliments the lemon. A splash of almond extract imparts a subtle almond flavor that goes great with lemon. Blueberries! 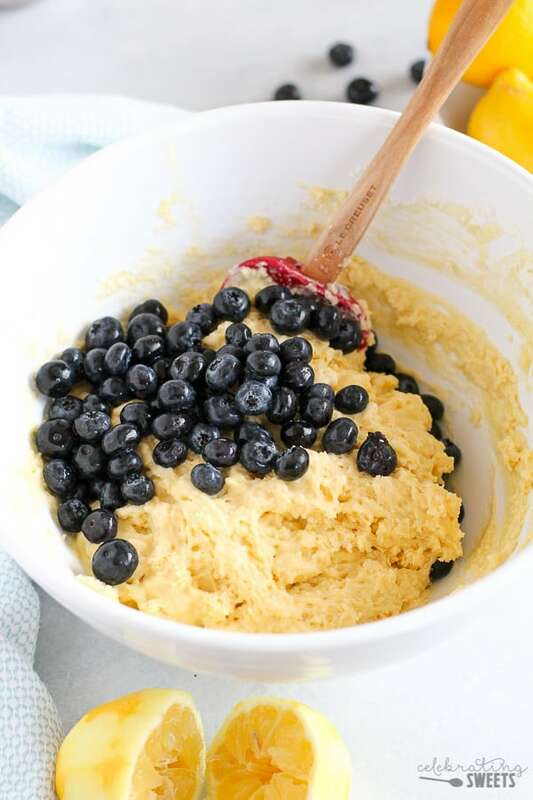 Lemon and blueberries were made to be together. The pop of fresh blueberries takes these over the top! Not a fan of blueberries? Leave them out and you’ll have a perfect lemon muffin. 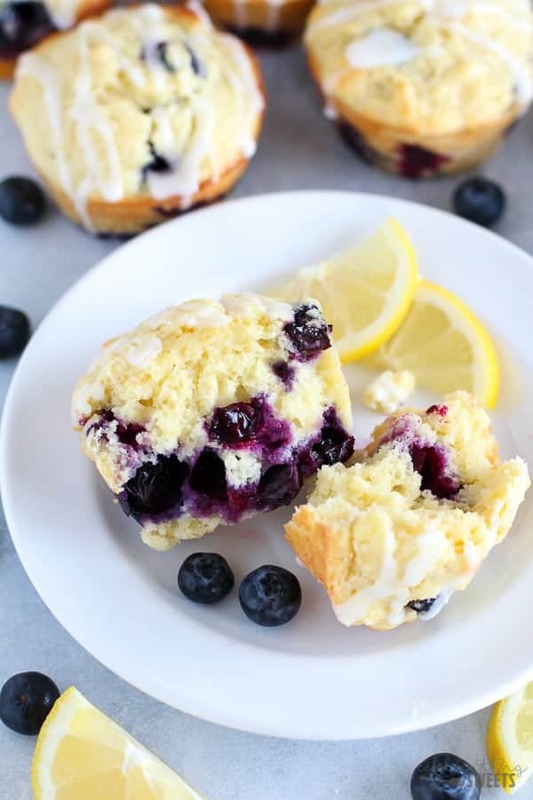 Fluffy and tender lemon muffins filled with blueberries and topped with a tangy lemon icing. Preheat oven to 375°F. Grease a 12 count muffin tin. In a large bowl, combine flour, baking powder, baking soda and salt. Set aside. In a separate bowl, whisk, sour cream, sugar, lemon juice, lemon zest, eggs, almond extract and melted butter. 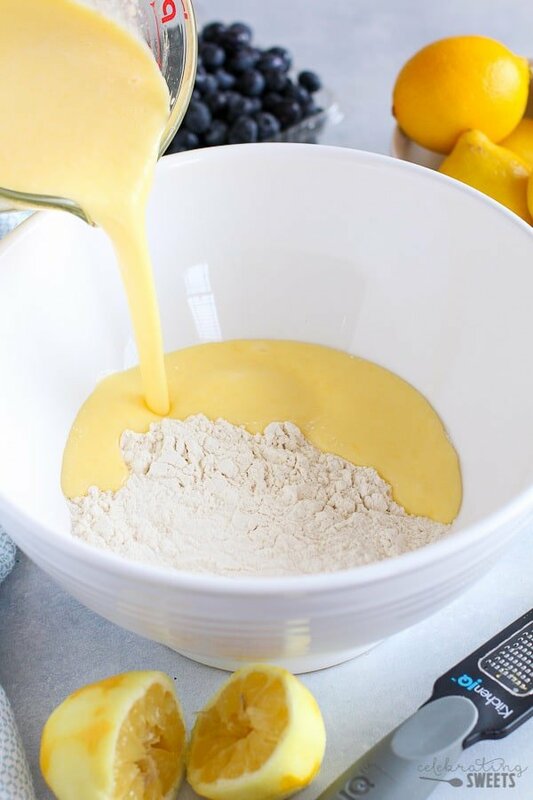 Pour the wet ingredients over the dry and carefully stir with a rubber spatula until the two mixtures are just combined (it will be thick and a little lumpy - that's ok - don't overmix). Carefully stir in the blueberries. Evenly divide the batter among the muffin cups. Bake for 15-18 minutes, until a toothpick inserted into the center comes out clean. Place the pan on a wire rack to cool for 5-10 minutes, then remove each muffin to cool completely. Whisk all ingredients until smooth. Adjust powdered sugar and lemon juice, as necessary to get your desired consistency. Drizzle icing over cooled muffins. 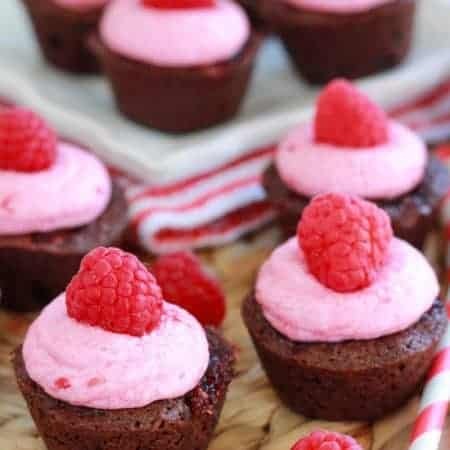 These muffins are the best the day they are made. Reheat briefly in a toaster or microwave if you're enjoying them in the days following. 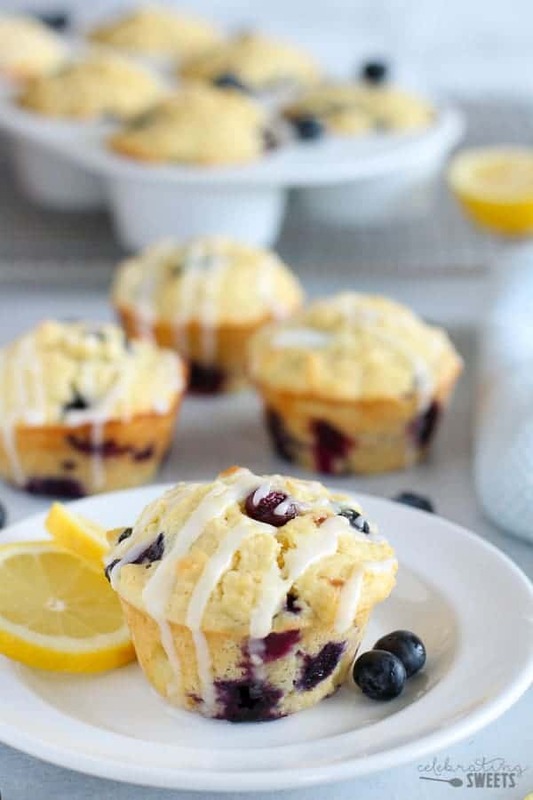 These lemon blueberry muffins are delicious. I followed the recipe exactly and it is perfect. I made it into a loaf one time (for a change) and it was the most delectable slice of lemon blueberry bread you could ever dream of. Thanks for a wonderful recipe. P.S. The glaze makes them to die for! Can you use frozen blueberry instead? Yes, that should be fine. I would recommend tossing them with a couple teaspoons of flour before stirring into the batter. Leave them frozen, do not thaw first. Also, they might bleed their color into the batter a bit, but that won’t affect the taste. Enjoy! I just made mine with frozen blueberries. I tossed them in a little flour first. It did turn my batter blue but it taste the same. I made these yesterday and they were probably the best muffin I have ever made, and I love making muffins 🙂 I used frozen blueberries, and used 2 cups instead of 1, as my kid can’t ever have enough blueberries in his muffins. Didn’t have a fresh lemon for zest, but I bet that would make it even better. And we skipped the icing as we had no powdered sugar, and I try not to have too much sugar anyway. Had to cook a couple extra minutes as they were pretty big muffins with all the extra blueberries. 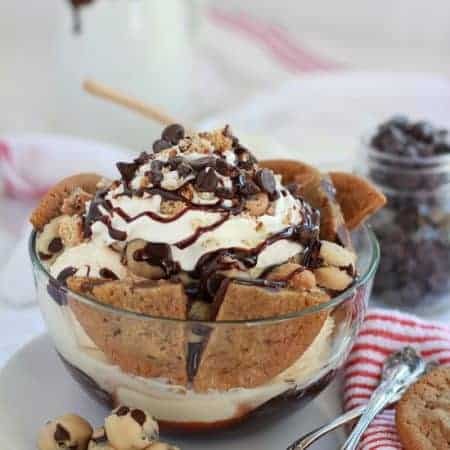 OMG, delicious! Saving this recipe for sure, and I will have to try and make it a loaf for pot lucks. Thanks so much, love it! Making these for an Easter party. Can I make ahead and freeze? Yes, you can freeze them. There is a chance that the blueberries might bleed their color into the muffins just a bit after defrosting. But the taste should be just fine. Wait to add the icing until after freezing and defrosting. Enjoy!